The Academy of American Poets designated April as the official month to focus attention on poetry, beginning in 1996. This annual celebration highlights the extraordinary legacy and ongoing achievement of American poets while marking poetry’s important place in our culture and everyday lives. You are invited to celebrate National Poetry Month by signing up for Knopf’s Poem-A-Dayprogram. Each day throughout April, Knopf e-mails out a free poem by a new or established poet drawn from the extensive list of books published by our family of imprints. 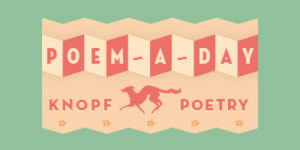 Among the Knopf poets featured in Poem-A-Day are Sandra Cisneros, Michael Dickman, Robin Coste Lewis, Sharon Olds, Robin Robertson, Brenda Shaughnessy, and Kevin Young. DAYS & DAYS by Michael Dickman, whose intuitive, agile verse captures us in its unusual pulse. Image-driven and shape-driven, these poems touch on parenthood, childhood, local natural habitats, graffiti culture, roses, and romantic love. THE OCTOPUS MUSEUM by Brenda Shaughnessy, informed by her craft as a poet and her worst fears as a mother, these bold and scathingly beautiful feminist poems imagine what comes after our current age of environmental destruction, racism, sexism, and divisive politics. THE LONG TAKE by award-winning British author Robin Robertson, and a finalist for the 2018 Man Booker Prize, is a noir narrative that tells the story of a D-Day veteran in postwar America: a good man, brutalized by war, haunted by violence and apparently doomed to return to it, yet resolved to find kindness again, in the world and in himself.